…my last entry was like one of my most commented on ever. People love them some graphic novels. 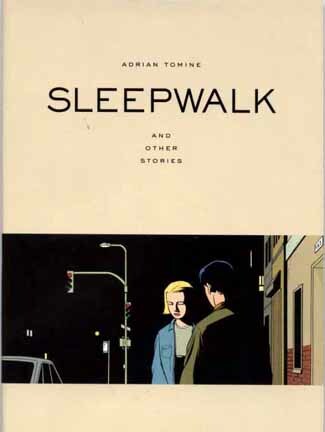 One of the ones that a friend recommended to me was Adrian Tomine’s “Optic Nerve” series. It’s a series of unconnected stories that are mostly about disaffected California high-schoolers and twentysomethings. What can I say? I am a sucker for angsty young realism. The comics were pretty good, but that’s not what I want to talk about. I want to talk about endings. I’ve always had a fascination for the non-ending. I think of Kelly Link as being sort of the master of the non-ending, but that’s probably only because she was the writer who introduced me to non-endings. But since then I’ve thought a lot about the non-ending. I think of the non-ending as being when a short story doesn’t end on an emotional moment. A story has a non-ending if its last line is not memorable. A story has a non-ending if it ends on a minor note. A story has a non-ending if it’s structured in any sort of traditional manner (five-act story structure, Freytag’s triangle, whatever), but then it ends before it reaches the place where that structure says its supposed to be going. Epiphany stories don’t have non-endings, they have epiphany endings. But some stories whisper to you that they’re going to be epiphany stories, and then end before either the character or the reader can have any sort of epiphany. David Foster Wallace’s Infinite Jest has the most colossal non-ending I’ve ever read. That is to say, is a non-ending really a kind of ending? Is it something that is actually suggested by the logic of the story? Or is it a kind of violence that is done to the story? In this post I will answer absolutely none of these questions. That was all just prefatory remarks. Because, you see, in the collection I read (which contains Optic Nerve #1-4), each issue contains four short stories, at maybe 4-12 pages each. And at least half of them have pretty solid non-endings. One of these stories, in Optic Nerve #2 has one of the “best” non endings I’ve seen in awhile. It’s called “Summer Job” its about a kid who gets a summer job at a print shop. They’re looking for someone who’ll be around permanently, so he lies to them and says that he’s transferred colleges and will be around for awhile. His boss chews him out some and sometimes cuts him some slack. He hates his boss. He jokes around with one female coworker and seems to like her, and invents a derogatory nickname for another. He steals some printing in order to print his zine (one of whose articles is “My crappy job”). A new guy starts working there, and when the kid tries to slack off, he gets chewed out by the new guy. The new guy apologizes to him, later. At the end of the summer, the kid gives his notice and no one seems to care much, except that one female coworker who makes him promise to visit again. Then there are five panels of him standing outside and smoking a cigarette while a few of his coworkers drop by to watch him leave. It is a very forgettable last page. But the story is totally awesome. It’s sort of just about the compromises you make to get what you want…without even really thinking about it. It’s about how you’re a jerk to some people and you’re nice to other people and you lie to some people and are honest to other people and its all sort of sleepy and random and indefinite. It’s hard to describe. But I think that, if in the end, the kid had uttered one single word of commentary about his job or about those people…if he’d done anything that seemed even a little like talking to the reader…then it all would have fallen apart. I think that blog entries often have non-endings. That’s because they take the first-person form of essays, which generally build up a pile of argumentation and end with a summation and conclusion, but are written and read more like newspaper stories (which go through their information in order of most interesting and important to least interesting and important). I just wrote a 71,000 word novel in 8 days. And you know what? It’s pretty good. Huh. Interesting. I’m not an endings sort of person. I totally agree about the purpose of the book/story isn’t what happens at the end but how you feel while you’re spending time inside. Usually by the ending, my interest is already trickling away.That said, no one ever lets me get away with non-endings when I’m writing, so I tend to get a bit hot under the collar when others do it. Like, “If I’m not allowed, then neither are you!” But I’ve read the Summer Job story, and I agree that if he had made any commentary, that would have lessened the story. So maybe the non-ending is one of things like post-modernism: it works when it works and it’s stunning but the rest of the time it’s just lazy. Beware the half-grasped imitation. Yes, I agree. Tomine clearly has a feel for what he’s doing…although I bet if Tomine brought in Summer Job to a writing workshop, people would recommend he fix the ending. Sometimes things work best when they’re presented authoritatively, within covers. Too true. Possibly also the pictures help. Haha, that’s true. With a graphic novel, you _know_ they didn’t just spew it out. They sat down and carved it out, line by line.